Cost-Effective Design: Innovative engineering and outside-of-the-box thinking paved the way for this durable, American-made, yet economical wall mount enclosure. 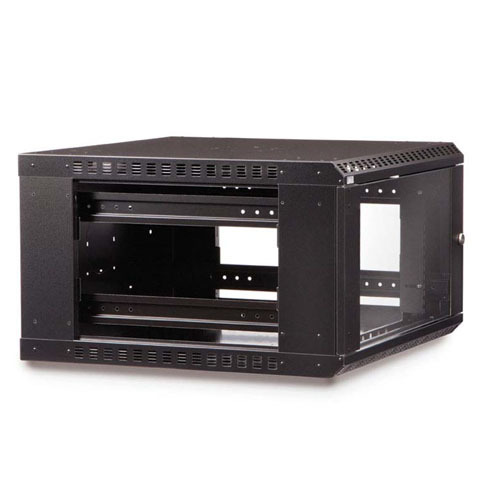 Numerous Laser Knockouts : Strategically placed laser knockouts provide a plethora of locations to feed copper or fiber optic cabling into the cabinet or to install an optional fan kit for temperature control. Adjustable Rails: The included set of cage nut style rails fully adjust in 1" increments to accommodate the various depths of equipment on the market. Additional rails are available for devices that require 4-point mounting. Removable Side Panels: Easy to remove side panels provide more access for growing or changing cabling schemes, as well as offer the option for increased airflow to prevent equipment from overheating. 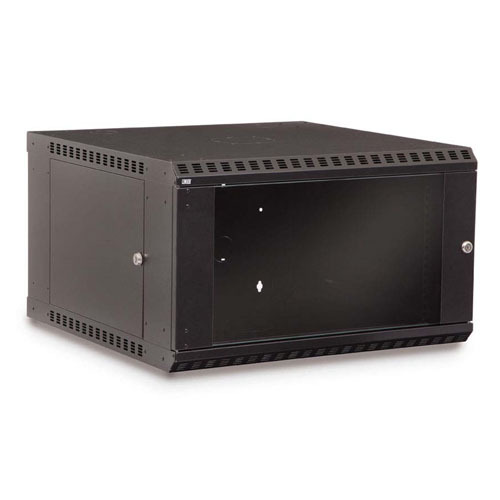 Locking Doors and Side Panels: The locking feature provides additional security for all three access points to keep your valuable rack mounted equipment safe from unauthorized use. Reversible Glass Door: Tempered safety glass door can be removed or reversed to be left or right mounted, to accommodate your particular installation. The glass door allows you to monitor your network system.